Always one of the highlights of the annual event at the NEC, Designers Block are returning to Interiors UK again this year, and this time they'll be taking over not one but two separate areas of the show. I exhibited at the show with Designers Block myself a couple of years ago and really enjoy the relaxed, friendly vibe of the spaces they design and curate, always discovering something new and interesting. Here's a preview of some of the designs appearing at this year's show. 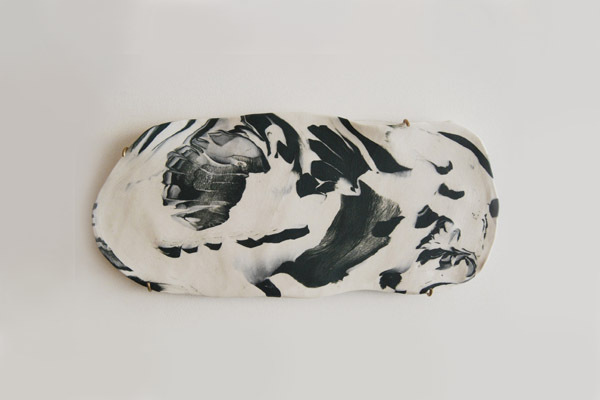 'Tunisia Made' is a series of homeware accessories by London based Tunisian designer Hend Krichen. 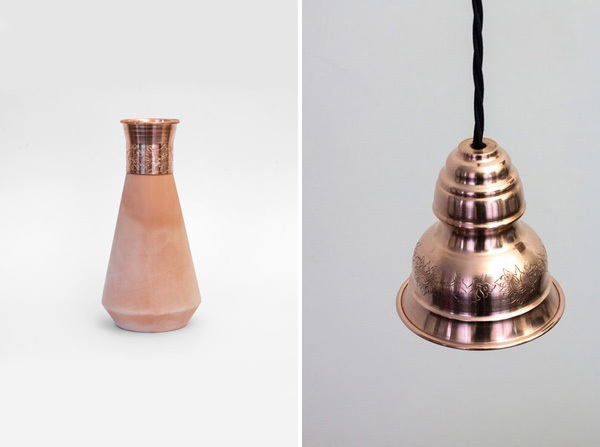 The collection, which draws on ties to traditional crafts in Tunisa, includes intricately engraved copper and ceramic vessels, lighting and textiles. Focusing on rural towns, Krichen works with local arts and crafts experts to utilise an authentic crafts manufacturing platform. The objects acknowledge the country's craft history and heritage while being designed for contemporary interiors. Mini hula pendant light by Laura WellingtonLaura Wellington will be presenting the mini hula - a cardboard pendant light cleverly presented in a neat packaging solution and designed to be self assembled from laser cut pieces which can be popped out of the packaging. Wall slate by Meghan Hutchins of Creo CollectivePolished concrete bowls by Katharina Eisenkoeck of Creo CollectiveCreo collective is a group of designers who work and research together after meeting on the MA Designer Maker course at Camberwell College of Arts. By playfully interrogating materials and reinventing traditional techniques they create timeless, covetable and collectables craft objects and lifestyle accessories for body and home, like this wall slate by Meghan Hutchins and Katharina Eisenkoeck's polished concrete bowls. Origami wall panel by FoldabilityFoldability is run by Kyla McCallum who graduated from Glasgow School of Art in 2012. Kyla works with origami to create lighting, products, packaging and bespoke pieces for interiors and events. Aren't these wall panels lovely? I think I might even be inspired to have a go at origami myself! The New Design Britain Awards - now in their 10th year, and judged across four categories: Furniture, Furnishing Accessories, Fabrics and Surfaces. This year the shortlist is exceptionally strong. Look out for Juliette Bigley's brass vessels and Alexander Mueller's woven easy chair. Birmingham City University's trends exhibition will feature student work produced in partnership with Brintons and Tektura, based around trend concepts identified by Global Color Research™ Mix Publications. (And the stand design is by my other half and Design Hunter contributor Graham Powell). This year Interiors UK also welcomes back Out of the Dark, the charitable social enterprise that recycles, restores and revamps salvaged furniture as a means to train, educate and employ young people from disadvantaged backgrounds. They'll be collaborating with designers including Deadgood and Naomi Cleaver to create four uniquely designed rooms containing upcycled pre-loved furniture. Interiors UK 2014 is at the NEC, Birmingham from 19-22 January.